As the tension mounted over the construction of the Berlin wall, JFK remained in Washington instead of making his customary summer Friday trip to Hyannis Port. 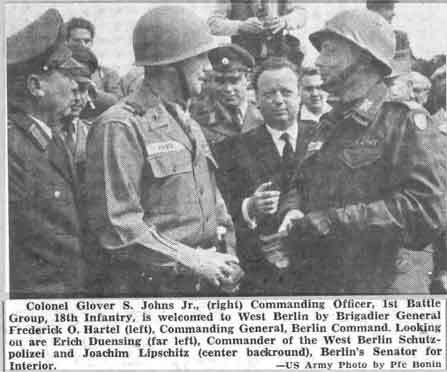 He pondered the credentials of Colonel Glover S. Johns, Jr., the Army officer chosen to lead 1500 American troops into West Berlin as a show of force. After reviewing his biography, Kennedy questioned choosing an officer for so an important mission that was not a West Point graduate.